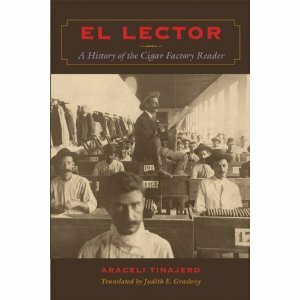 Last Thursday I attended a very interesting lecture at Upper East Side’s Americas Society celebrating the release of City College professor Araceli Tinajero’s English edition of El Lector: A History of the Cigar Factory Reader (El Lector de Tabacaria, translated by Judith E. Grasberg, University of Texas University Press, 224 pages, $ 40 on Amazon.com). of something I knew nothing about: the long tradition of having people read out loud in cigar factories as workers do their jobs. The evening began with a brief introduction by Mr. Shapiro. He was followed by Prof. Font, who briefly spoke about the book and about the custom, which began (and still continues) in Cuba and later spread to cigar factories in Key West, Tampa, The Dominican Republic and in Mexico. Next was Prof. Echevarria’s very academic review of the book. He praised Prof. Tinajero’s efforts in researching this apparently not very well documented history, and commented on some of its most interesting parts. Finally, Prof. Tinajero gave us a detailed account of how the project began (she had a conversation with an old Cuban man who had done the job before), her travels to the countries where the tradition exists (including Cuba), while reading passages from both the English and Spanish editions. She mentioned some historical tidbits about how the readers influenced the factory workers politically, and how strongly those workers felt about the material read to them. Prof. Tinajero also gave an emotional account of having given a copy of the Spanish edition to her ailing father. She choked when she recalled that her father’s doctor read the book to him, and that it was the last book he was read to before he passed away in 2007. She also mentioned that the book had some very positive repercussions, and that some cigar factories in Bolivia and Brazil (!) are considering implementing the system there as well as a way to increase productivity. cultural manifestation. I am sure that many in attendance felt the same way.